Thousands of British Gas engineers are to stage five 24-hour strikes in the run-up to Christmas and after New Year. GMB union leaders meeting near Birmingham agreed stoppages for 12, 19 and 21 December, and 6 and 9 January. Out-of-hours calls will also not be handled from 12-23 December and 4-10 January, in a row over plans to close the final salary pension to new staff. British Gas's parent firm Centrica has said its new pension package is one of the best on the market. The GMB union has accused the company, which trades as Scottish Gas in Scotland, of breaking a deal it struck two years ago. 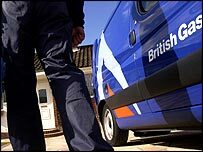 Spokesman Brian Strutton told the BBC that the union had offered British Gas the chance to discuss arrangements for the vulnerable customers. "We have today put together a plan for those customers who might be at risk. We'll be offering that to British Gas so we will provide that service to those people," he said. "British Gas haven't responded to us about it yet, but we're sure they will - they'd want to look after the customers just as we would." Nearly 6,000 engineers, who repair and service domestic boilers, backed industrial action by a ratio of four to one in a vote last week.